Hometown: Ramsey, New Jersey, U.S.
Died: April 9, 2010 in Operation Enduring Freedom. Unit: Army, 3rd Battalion, 75th Ranger Regiment, Fort Benning, Ga.
Cpl. Michael D. Jankiewicz, 23, of Ramsey, N.J., died April 9 in Zabul, Afghanistan, of wounds sustained when the CV-22 Osprey he was flying in crashed. He was assigned to the 3rd Battalion, 75th Ranger Regiment, Fort Benning, Ga. Son of Serena B. Jankiewicz (nee Friedman) of Ramsey, NJ. Loving brother of Michelle L. Jankiewicz of Midland Park, NJ. Beloved son of Anthony J. Jankiewicz of E. Stroudsburg, PA. Loving stepson of Carmen Jankiewicz. Dear stepbrother of Hector Emmanuelli and Noemi Cagley. Adored grandson of Abraham Friedman. He is also survived by all comrades, friends and extended family. Cpl. Michael Jankiewicz graduated from Ramsey High School in 2006. ​A 23-year-old Army Ranger from Ramsey was killed in Afghanistan last week, along with three others, when a U.S. Air Force Osprey crashed in Zabul Province, about 200 miles southwest of Kabul. “It was just a tragic accident,” Anthony Jankiewicz, of East Stroudsburg, Pa., said Sunday, although Army officials “in the know” have been unable to provide details about the Thursday crash. Two other military personnel and a civilian contractor were also killed in the crash, the tilt-rotor aircraft’s first within a combat zone, according to NATO officials. A Taliban spokesman initially said militants had shot down the aircraft, but officials in Afghanistan have discounted that claim. Anthony Jankiewicz said he learned that something had happened to Michael while at work Friday at his trucking firm in Elizabeth. Jankiewicz was 23.“I only prayed that he was not in the enemy’s hands,” he said. 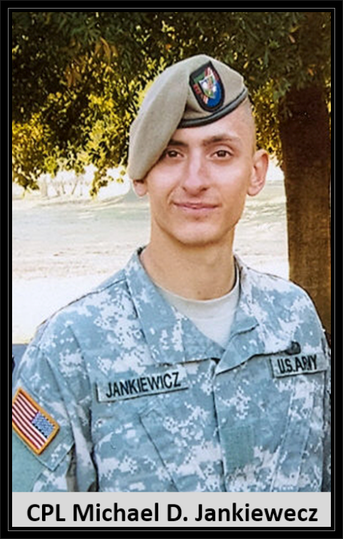 On Sunday, Michael Jankiewicz’s family said that in his four years in the military, Michael never talked about his work. He was an Army Ranger, a member of the military’s elite rapid-strike force that specializes in covert missions. Michael, serving with the 3rd Battalion, 75th Ranger Regiment, had just left for his second tour of Afghanistan in March, after having served twice in Iraq. “My brother had a love for this country … he’s a hero,” said his sister, Michelle Jankiewicz, 27, of Midland Park. Michael graduated from Ramsey High School in 2006. Never the “greatest” student, according to his father, he played a little golf, loved history and knew he wanted to be a soldier as a child. “He could have been 3 years old when he was talking about it,” said his father. Michael was never injured overseas, but he did suffer a broken femur during an airborne exercise in Savannah, Ga., while landing hard with a .50-caliber machine gun. Though the Rangers’ tough training regimen apparently never bothered the 6-footer. At the family’s house in Ramsey on Sunday, and on Michael’s Facebook page, friends paid their respects throughout the day. “He once told my mother that if anything happened to him at least he would be doing what he loved,” Michelle Jankiewicz said. She said an Army buddy is bringing “Hans,” Michael’s German shepherd, home toRamsey from Fort Benning, Ga. “He always wanted a German Shepherd … he had a stuffed German Shepherd as a youngster, and finally got a real one he named Hans six months ago,” Michelle said. Funeral arrangements have not been finalized, but will be handled by the Van Emburg-Sneider-Pernice Funeral Home in Ramsey. 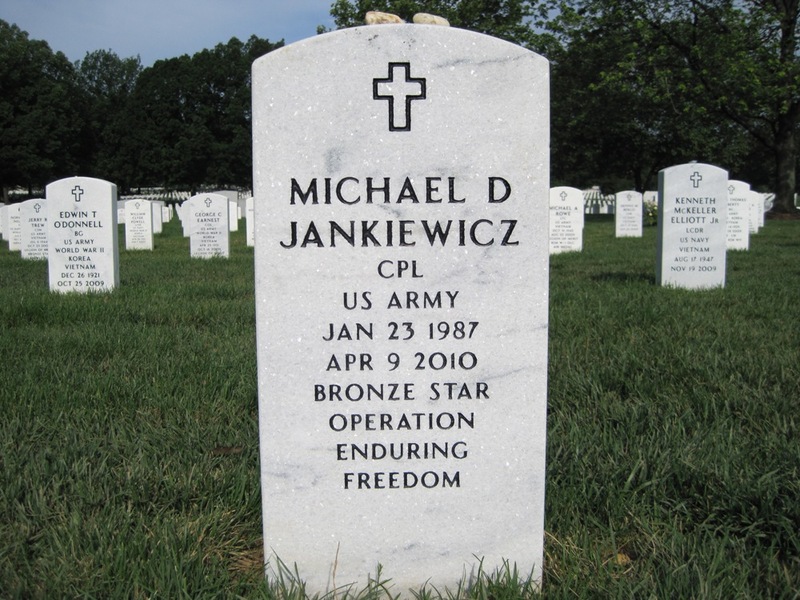 Michael Jankiewicz will be buried in Arlington National Cemetery in Washington.